Lake-George is located in the north-central portion of Lower Michigan in the heart of Clare County, in what locals call the "Lakes Section." It's conveniently near the junction of the U.S. Highways 10 & 27. This small community began as a lumber town in 1880 and is situated between two lakes, Lake George to the south and Shingle Lake to the north. The area grew as a result of being a stop on the Toledo, Ann Arbor and Northern Railroad, however, it never incorporated as a village or city, but remains under the jurisdiction of the Township. Today, the Lake George area is a heavily developed and popular resort area with a park located at each lake, and many cottages and homes surrounding the two bodies of water. Altogether there are 19 lakes within a ten-mile radius of Lake George, and also The Muskegon River, Middle Branch River and Chippewa River are nearby. The lakes provide fishing, boating, swimming, water skiing and all types of water sports, while the rivers are popular for canoeing, tubing and fishing. Lake George is also near golf courses, snowmobile trails and ski areas, and The Rails to Trails runs right through the Lake George area. Lake George is approximately an hour and a half from Grand Rapids and two and half-hours from Kalamazoo. For more Lake George MI. Information, please contact Michigan Vacations. 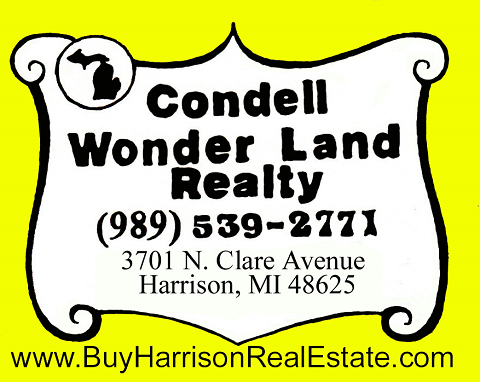 Condell Wonder Land Realty has a great selection of all types of Northern Michigan Real Estate and has been listing and selling Lake George MI. Real Estate for many years, so if you are looking to buy or sell property in Lake George MI. please contact us!